Pam Cooking Spray Mission #Giveaway (2011 Holiday Gift Guide) CLOSED! Can you believe that Thanksgiving is just next week? Well neither can I. I have gone out and bought the items we need for our feast, but after Thanksgiving, I have to stock up and prepare for the Christmas dinner we will be hosting this year at our house. We have hosted Thanksgiving both at our house and at the Ronald McDonald house in past years, but this will be the first Christmas dinner for us this year. I have been planning out the menu for Christmas and working on getting a few items here and there, but we are expecting quite a few people and Christmas will be bigger than Thanksgiving this year. For Thanksgiving we have decided to stay home. We are on a very tight budget, so with limited funds for food, we can only do one big meal this year. So we will not be going to making a grand feast, just enough for us and the kids, and we have put our big meal plan focus on the Christmas meal. I have been working on sampling some items that we plan on using and trying some items ahead of time, so we are all set when it is time to serve the big meal this year. One item that is a must have and we buy a few of, are the non-stick sprays. We usually stock up on the Pam this time of year. Well, Pam has a new and improved cooking spray that is here just in time for all of that holiday cooking. I was very lucky enough to be sent some great coupons so I could get a chance to try this new Pam and some Hunt’s Canned Tomatoes! Along with these great coupons I was also given a step-by-step guide with some great recipes to try out with these products. 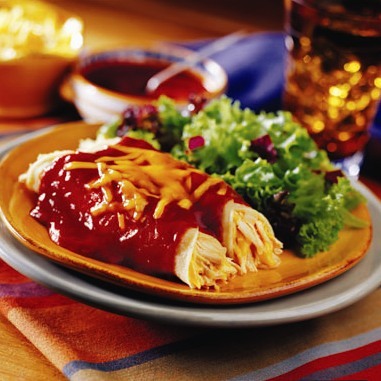 We love enchiladas, so after getting the can of Pam and the can of Hunt’s Canned Tomatoes, we went through the guide and looked through the recipes, then decided to go with the Easy Cheesy Enchiladas. These were very easy to prepare after following the directions, then after they were all done cooking, they were easy to serve. They did not get stuck to the pan so the cleanup was very easy as well, thanks to the new and improved Pam Cooking Spray!!! I will not cook or bake with out cooking spray, and my husband has learned why, after I made him do the dishes after he cooked a casserole with out using any cooking spray!! Well this holiday season, I was given a extra set of coupons and an extra step-by-step guide to give to one of my amazing readers! Tell me what your favorite dish using Pam is!! Please leave your email in a comment below! Previous Post Imagine Toys #Giveaway (2011 Holiday Gift Guide) CLOSED! Pam is perfect for brownies.